In another sign that mobile video may be one of the breakout successes of 2012, music video portal Vevo reports that mobile access to its library of content has increased exponentially this year. In its newly released Music Video Viewership Report, the company says video streams to mobile devices increased 700% between January and October. Mobile prime-time for video viewing parallels TV patterns, with peak access between 6 p.m. and midnight. As one of the largest video providers on the Web, Vevo’s stats provide a rare snapshot into the ways that rich media use is accelerating on mobile. The portal serves up to 875 million streams a month overall, the report notes. But in October, 139.6 million went to mobile devices, including smartphones across multiple operating systems and tablets. 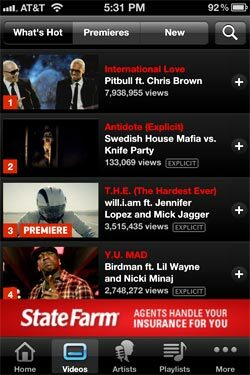 Mobile is the fastest-growing traffic segment for Vevo, as its apps have been downloaded 13 million times. More significantly, 3.9 million people were actively using the app in October, which means that 38% of the downloaders are coming back on a regular basis. Since much of mobile music video viewing is occurring in repose, it is understandable that engagement is considerable. Vevo says its video consumers are spending 55 minutes a month with the apps, and 78% of users are streaming seven or more videos. Interestingly, while conventional wisdom suggests that Apple iOS is the stickiest platform when it comes to content consumption, Vevo finds that its Android users are spending the most time with the content. For the consumption of short-form media like music video and user-generated clips, mobile appears to be in growth mode. Vevo echoes survey results that Google published in November showing that 75% of YouTube Mobile users say the handset is now their primary device for viewing videos from the portal. In metrics released last week, Nielsen found that there were 26 million mobile video viewers in the U.S. on smartphones and another 5 million using feature phones in the third quarter of 2011. Video viewing has reached 14% of the mobile audience, up from 10% a year ago. Vevo says that since its mobile apps tend to skew younger, some brands have been buying mobile advertising on the apps predominantly, including Neutrogena and Clearasil. Other sponsors that are focusing budgets on the mobile platform are McDonald’s, Trident, Target, NBC universal’s Bravo network, Wendy’s and Ben & Jerry’s.